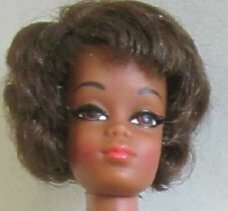 Christie, Barbie's Friend, was considered the very first "black" Barbie. Even though Francie was released in 1967, Christie had the first real "black" features. She was released in 1968. There were 4 versions of this doll; #1126 Talking (1968-1972), #1119 Twist' n Turn (1970-1972), #1175 Live Action (1971-1972), and #7745 Sunset Malibu (1973-1976). Christie shared Barbie's wardrobe. Christie is marked as follows: TNT Christie: ©1966/Mattel, Inc./U.S. Patented/U.S. Pat. Pend./Made in/Japan, Talking Christie: ©1967/Mattel, Inc./U.S. & Foreign/Pats. Pend./Mexico, Live Action Christie: ©1968/Mattel, Inc./U.S. & Foreign Patented/Patented in Canada 1967/Other Patents Pending/Taiwan, Sun Set Malibu: ©1966/Mattel, Inc./U.S. & Foreign/Patented/Other Pat's/Pending/Made in/Taiwan. #7745 Sun Set Malibu Christie (1973-1974) In 1974 her swim suit was a yellow two-piece suit & she was "Made in Korea". Many of the earlier Talking Christies (1968-1970) and the Twist ‘n Turn Christie dolls (both with the shorter hair style) over time did have hair that oxidized to a red color which are the most common. 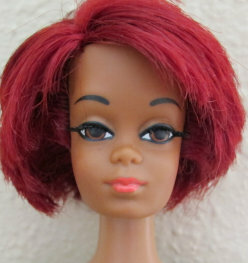 They also had a slightly lighter skin tone than the later dolls. The later versions of Christie (Live Action and Sunset Malibu) that came out with long hair retained their original color as well as the short-haired 1971-1972 Talking Christie dolls. Their Afro hair was modified along with their skin tone in 1971.